The Niagara is one of the most alluring destination in the entire world and all and sundry pines to pay a visit to this awe-inspiring destination at least once in a life time. Several tour operators around the world are absolutely in readiness in to ferry you to this part of the world. So the question is after you get in touch with the particular tour operator, you should get a grab of the areas which would be covered during the tour. The most popular and most alluring of the three falls relating to NIAGARA SIGHTSEEING TOUR is the Horseshoe because of the sheer size and the “U” shaped structure making it the absolutely exclusive backdrop for any tourists. 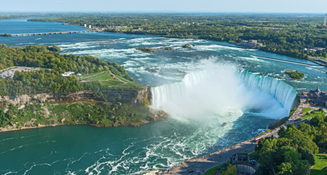 Since the falls are being located on the border line of both Canada and the United States they can be viewed from Canada in a much better manner and allows the individuals to witness the entire falls. Although the American side did have a larger pedestal being built, extending out over the flat edges of the George in order to provide slightly a better view. It still cannot be compared with anything else that can be witnessed on the Canadian side. Grabbing the supreme view- From the Canadian side the visitors will be finding a complete opaque view of all the three major falls from just any point along the Niagara parkway. Commencing at the rainbow border bridge and heading all the way southwards to the table rock centre being located at the brink of the particular falls. It is to be noted that the visitors can walk along the extra wide sidewalks and grab in the winsome views the whole way. Throughout this visitors of NIAGARA FALLS TOUR will also have to use the platforms which are being defined as viewing platforms and the telescoping binocular viewers in getting a close up look at the falls. Maid of the mist- This particular boat tour attraction is being available on both American and the Canadian sides of the falls and provide the visitors an up close and elegant views. In order to avail the best of views get in touch a tour bus service provider who will take you right at the spot.